Christopher Gadsden (17241805), a soldier and statesman from South Carolina, was the principal leader of the South Carolina Patriot movement in the American Revolution. He was a delegate to the Continental Congress and a brigadier general in the Continental Army during the War of Independence. Gadsden was born on February 16, 1724 at Charleston, South Carolina. He was the son of Thomas Gadsden, who had served in the Royal Navy before becoming customs collector for the port of Charleston. Christopher was sent to school near Bristol, England. He returned to America in 1740, and served as an apprentice in a counting house in Philadelphia, Pennsylvania. He inherited a large fortune from his parents, who died in 1741. From 1745 to 1746 he served during King George's War as a purser on a British warship. He entered into mercantile ventures, and by 1747 he had earned enough to return to South Carolina and buy back the land his father had lost by gambling in 1733. Gadsden began his rise to prominence as a merchant and patriot in Charleston. He prospered as a merchant, and built the wharf in Charleston that still bears his name. He served as captain of a militia company during a 1759 expedition against the Cherokees. He was first elected to the Commons House of Assembly in 1757, and began a long friction with autocratic royal governors. In 1765, the assembly made him one of their delegates to the Stamp Act Congress in New York City, which was called to protest the Stamp Act. While his fellow delegates Thomas Lynch and John Rutledge served on committees to draft appeals to the House of Lords and Commons respectively, Gadsden refused any such assignment, since in his view Parliament had no rights in the matter. He addressed himself with outspoken support for the Declaration of Rights produced by the Congress. His addresses brought him to the attention of Samuel Adams of Massachusetts, and the two began a long correspondence and friendship. Gadsden was eventually known as "the Sam Adams of the South." On his return from New York, Gadsden became one of the founders and leaders of the Charleston Sons of Liberty. He had risen to the rank of lieutenant colonel in the militia. He was elected as a delegate to the First Continental Congress in 1774 and the Second Continental Congress the following year. He left Congress early in 1776 to assume command of the South Carolina 1st Regiment of the Continental Army and to serve in the First General Assembly of South Carolina. As the British prepared to attack Charlestown on June 28, 1776, Major General Charles Lee ordered outlying positions abandoned. Rutledge and the local officers disagreed. A compromise was reached and as Col. William Moultrie prepared the defenses on Sullivan's Island, Col. Gadsden paid for, and his regiment built, a bridge that would allow their escape if the position were threatened. The British attack was repulsed. On September 16, 1776, the Continental Congress commissioned him a brigadier general in the state's Continental Line. He resigned on August 21, 1777 due to chronic disagreements between him and Brig. Gen. Robert Howe, who had been given command of all Continental forces in the Southern Department. In 1778, Gadsden was a member of the South Carolina convention that drafted a new state constitution. In 1780, he was elected Lt. Governor under Gov. John Rutledge. When the British laid siege to Charlestown in 1780, Governor John Rutledge fled to North Carolina to ensure a "government in exile" should the city fall. Gadsden remained, along with many others of the South Carolina government. Major General Benjamin Lincoln surrendered the Continental Army garrison on May 12 to General Sir Henry Clinton. At the same time, Gadsden represented the civil government and surrendered the city. He was sent on parole to his Charleston house. After General Clinton returned to New York, the new British commander in the South, Lt. General Charles, Lord Cornwallis, changed the rules. On the morning of August 27, he arrested about twenty of the civil officers then on parole. They were marched as prisoners to a ship and taken to St. Augustine, Florida. When they arrived, Governor Tonyn offered the freedom of the town if they would give their parole. Most accepted, but Gadsden refused claiming that the British had already violated one parole, and he could not give his word to a false system. As a result, he spent the next 42 weeks in solitary confinement in a dungeon at the old Spanish fortress of Castillo de San Marcos. When they were finally released in 1781, they were sent by merchant ship to Philadelphia. Once there, Gadsden learned of the defeat of Lt. General Charles, Lord Cornwallis at Yorktown. He hurried home, to help the restoration of South Carolina's civil government. Gadsden returned to the state's House of Representatives, then meeting at Jacksonboro. At this session, Gadsden was elected as the governor, but felt he had to decline. His health was still impaired from his imprisonment, and an active governor was needed since the British had not yet given up Charlestown. So in 1782, John Mathews became the new governor. Gadsden was also a member of the state convention in 1788 and voted for ratification of the United States Constitution. He died from an accidental fall on September 15, 1805, in Charleston, and is buried there in St. Phillip's Churchyard. Gadsden was married three times, and had four children by his second wife. Christopher Gadsden was born in Charleston in 1724. He was educated in England, where he became accomplished in the learned languages. He returned to American at the age of sixteen and entered the counting house of a merchant in Philadelphia, where he remained until he was twenty-one years of age. He then went to England and on his return engaged in mercantile pursuits in Charleston. He was successful and was soon able to purchase all of the property known as Ansonborough, which his father lost in play with Lord Anson. His house was upon the lot now owned (1848) by Mrs. Isaac Ball, and the kitchen is yet standing on the lot at the northeast corner of East Bay and Vernon Streets. 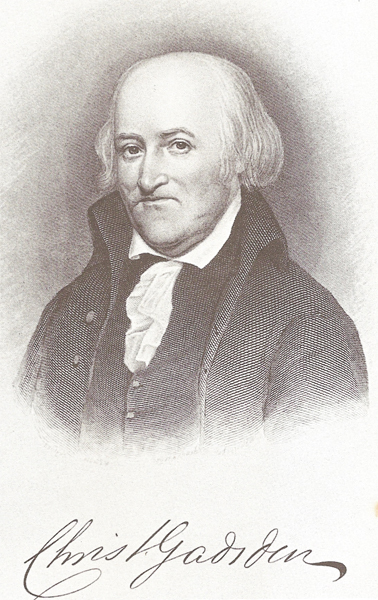 Mr. Gadsden was one of the earliest opponents of Great Britain in South Carolina, and as the Revolution advanced was one of its firmest supporters. He was a delegate in the first Continental Congress in 1774 and his name is attached to the American Association agreed to by that body. In 1775, he was elected senior colonel and commandant of three South Carolina regiments, and was subsequently made a brigadier. He was in the engagement at the siege of Charleston in 1776. He was one of the framers of the Constitution of South Carolina, adopted in 1778. He resigned his commission in 1779, and when Charleston was taken by Clinton in 1780 he was lieutenant governor, as such he signed the capitulation. Three months afterward he was take, with others, and cast into the loathsome prison at St. Augustine (an act in open violation of the terms of capitulation), because he would not submit to indignity at the hands of Governor Tonyn. There he suffered for eleven months until exchanged in June of 1781, when he sailed to Philadelphia with other prisoners. He returned to Charleston and was a member of the Assembly convened at Jacksonborough in the winter of 1782. He opposed the confiscation of the property of the Loyalists, and thereby won their esteem. He was elected governor of the state in 1782 but declined the honor and went into the retirement of private life. He died on August 28, 1805, at the age of eighty-one years.